Overestimating is one of the key barriers to capital effectiveness for site and sustaining capital (SSC) projects, which typically lack sufficient owner cost engineering and estimating resources and data to effectively support their portfolios. The Site Portfolio Tool fills this void by providing a robust kit of cost and schedule competitiveness and predictability KPIs at the corporate, site, and project levels. This web-based software enables all stakeholders to quickly assess capital project performance levels in real time, analyze trends, and generate insights to make more informed decisions. 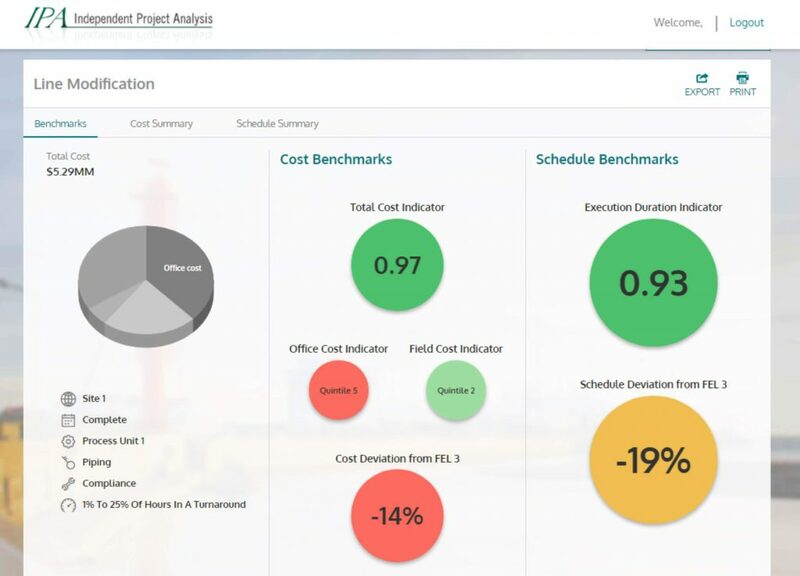 Assess the overall performance of your SSC portfolios with aggregated cost and schedule KPIs for all projects, as well as individual project competitiveness and predictability measures. Identify patterns in project performance by breaking down portfolio KPIs by project characteristics of interest, such as size, project strategy, turnaround construction, etc. Easily generate and share portfolio summary and individual project reports to facilitate data-based decision making. Contact us to learn more about the Site Portfolio Tool and to see how it works.